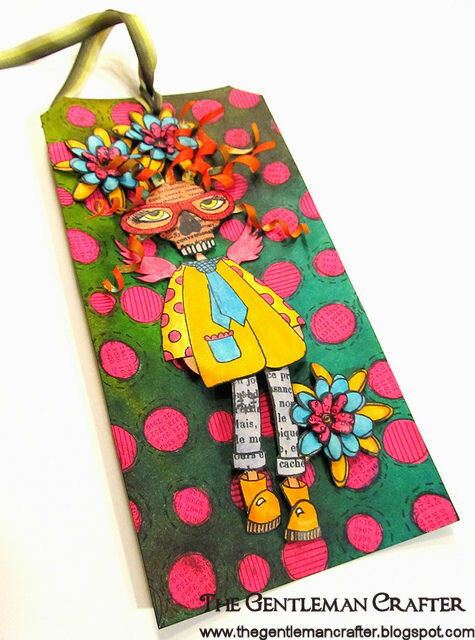 The Gentleman Crafter: A Funky Fab Dy Tag! I just have one more tag to share with you this evening! This tag is a welcome to the Fabulous Dyan Reaveley who just called and said she was stuck in the airport in the US for a four hour layover. I asked her what she was going to do to fill her time for the four hours....She laughed at me and said doodle in my journal of course! LOL! duhhh! Where was my brain! At least she is safely in the US! Welcome Dyan back to the United States of America! Yahoooo! I just got off the phone with my mom. She asked me, "why do people do tags Jim?" My reply to her and you all who have never done one, It's a fast and easy piece of art. What I didn't tell her was that the tag I am about to show you took several hours to complete, but still, it's not a three day project. So, that's my reasoning....Yours may be different. It's just nice to feel like you have completed a project and tags do that for me. Supplies Used can be found at Inspiration Emporium in the US and Art From The Heart in the UK. I sprayed puddles of Cut Grass, Fresh Lime and Pure Sunshine on the tag and spritzed water on top to help blend the colors together. I allowed to dry. I then stamped the circles onto the tag with the Around The Edge Stamp. I then bleached out the circles with water and allowed to dry. Next, I inked in the Bubblegum Pink into the circles. I stamped the flowers, body, glasses, face and jeans onto Ranger's Inkssentials Manilla Cardstock; colored them and cut out. I took my sylus and a foam mat and rounded the pieces to make them dimensional. Next, I glued them to the tag, the flowers to each other and then glued them to the tag as well. I sprayed some cardstock with the Squeezed Orange Ink Spray and cut small 1/8-inch strips from it. I then wrapped them around a bamboo skewer and glued them on as the hair. Applied some ribbon to the top of the tag and that's it! A Dylusional Funky Fab Dy Tag! Well back to finishing up the tutorials! LOL! Yes, I'm still working on them! Bahahahaha! Ooooooooo! Loving the funky tag. I have my first Dylusions stamp set and have been having coloring them with my distress markers. Thanks for the tag inspiration this week. Uh, meant to say have been having fun coloring. Lol. LOVE this!!!!!! Soooo much fun! A new side of Jim comes out to play! thanks as always for sharing. HA....made me laugh out loud...such a funky, funny tag! Look at them dentures hahaha. Cute, cute tag Jim. wow, I love your tag! colorfull start of a grey day! Love love love it! I am very excited for the weekend - received the last bits I need to create the ink brushes this weekend and I plan on playing with my stamps and journal this weekend! Thanks for the inspiration!! I need to get myself on one of Dyan three day courses. Art from the heart is only 20 miles away from me. Great tag Jim. I am so glad you went Dylusional, Jim. I just love this kind of art with all the bright colors, etc. You are my muse! Have a terrific day. And P.S. for your mom... tags are the bomb. They can be used to dress up a package, used as a book mark, etc. I love wrapping things and this just adds a bit of fun to the wrap! Soooo cool. I love the funky guy! Great background. I love tags! I get asked that a lot. I know I use them for gift packages and gift bags. I think they are nice personal touches. I know exactly what you mean about a "quick" piece of art. I just never quite know what to do with my tags after I'm done. Mine are in a box. I always forget about the bleaching technique. GREAT tag! WOW!!! what a fantastically fun tag! I love tags as well, but I make a "matching" type envelope and then stick the tag inside to make sort of a card :) Love the result of this tag, so very bright and fun. Cindy that is a great idea to make a sort of card with the tags! Hmmmm, now I'm wondering if one of my cricut carts has a good sized envelope. Thanks! What fun. Just a delight as usual. Thanks for the tag explanation I might make a few to feel like I am creating something. Your work is inspiring. How cool would it be if TH or Dyan did some kind of "bobble" thingy ... so like, the legs on your "girl" (lol) would sway back and forth! Just an idea. As always, I love sll your creations and am so glad you continue to share them with us! You are a rock star! A great colourful tag - very cheerful! Love the tag and it makes me smile. I really enjoy making tags, but your mom has a good point. Tags are great for packages, but after that I never know what to do with them. I'm going to make a project soon to showcase our tags so stay tuned! LOL! 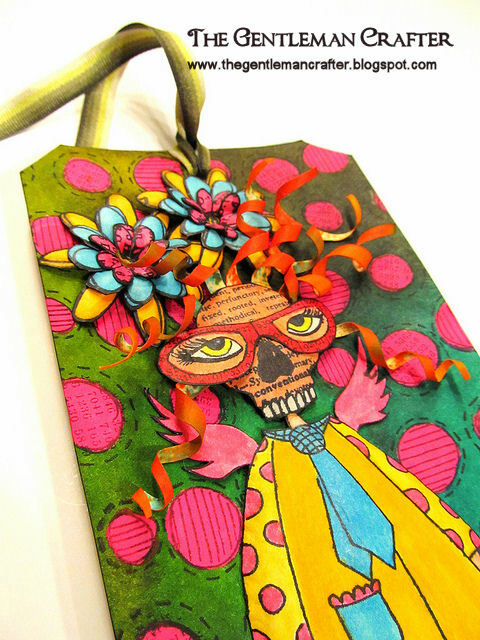 Love this fun and funky little tag!! 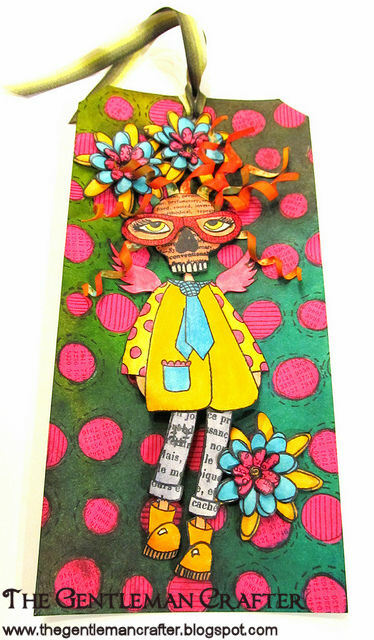 I'll be taking an art journal class with Dyan tomorrow at The Queen's Ink here in Maryland. I am SO excited and I can hardly wait!! You are having way to much fun with Dylusions... LOL !Still trying to gert to mine ! Loving the bright colors. As much as I love my well used stash of TH supplies, I was really wanting to add some brightness into my artwork. Dyan's colors do it very nicely, thank you very much. Love seeing what you do with them.